The estate comprises a total of six former farmhouses and a castle, all of which were lovingly restored into luxury homes. Each house is part of the estate, has its own land and no close neighbours, yet enjoys the assurance of being part of a fenced-in and managed property. 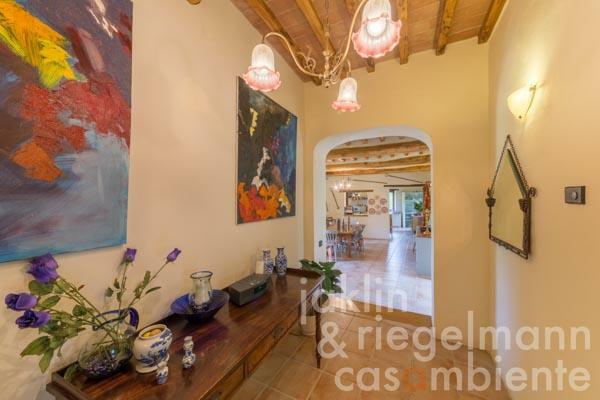 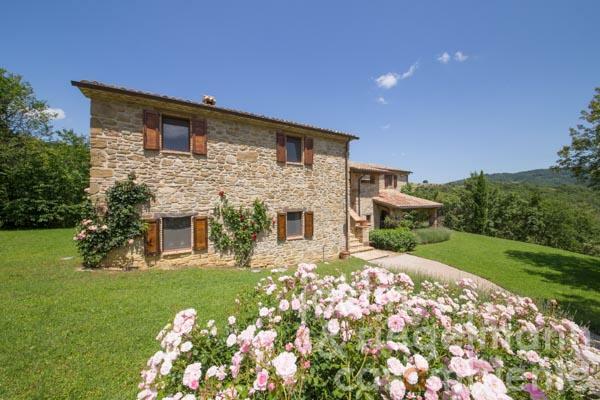 This country house for sale was elegantly designed and restored in 2005 while maintaining its original character and implementing all modern amenities. There are beautiful lawns around the house and the large pool, situated slightly above the house, has a wide tiled area and sun terrace. 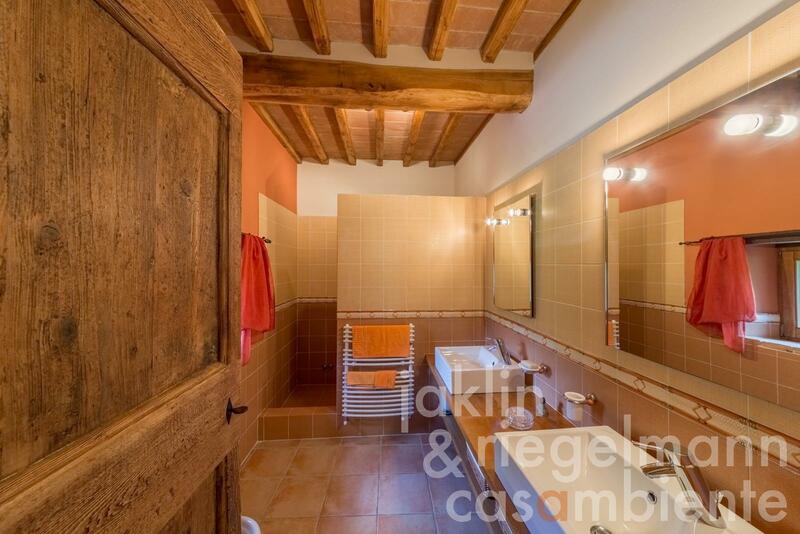 Linked to the main pool, but separated by a small wooden bridge, there is a safe paddling pool. 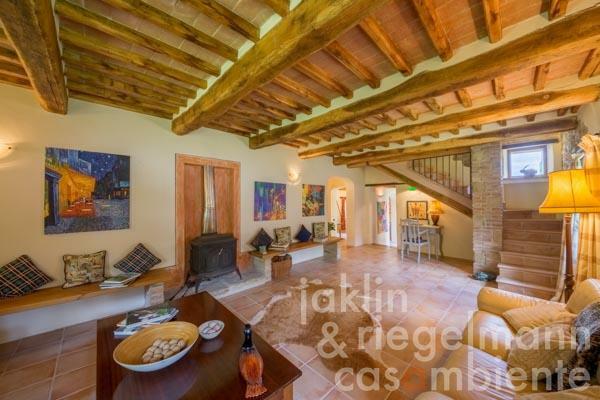 The living space in the house comprises on the ground floor an entrance hall with guest bathroom, large reception room with wood-burning stove, dining room with access to the back terrace and barbecue area, modern kitchen with professional equipment and access to the covered front terrace, and a pantry/laundry room, which can also be reached from the outside, as well as a bedroom with en-suite bathroom. 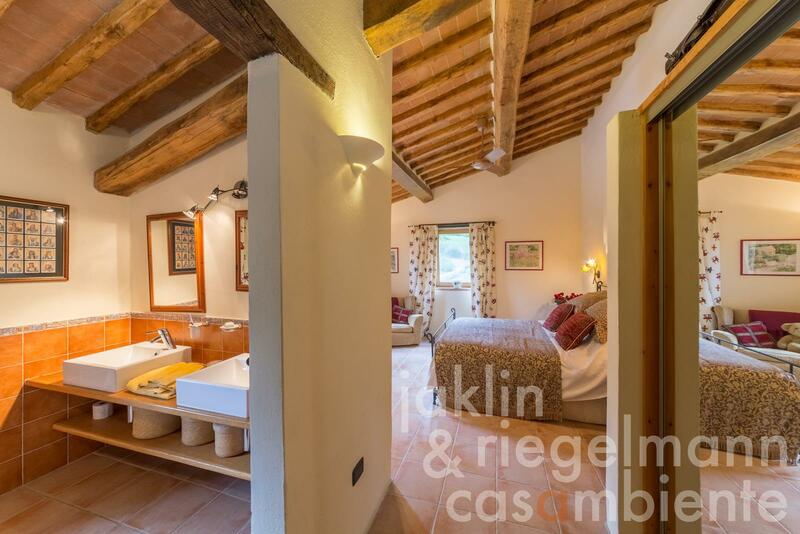 The first floor offers three bedrooms with en-suite bathrooms, snug separate media area, and a loggia with external access. Both levels enjoy discreet underfloor heating, so there are no obtrusive radiators. 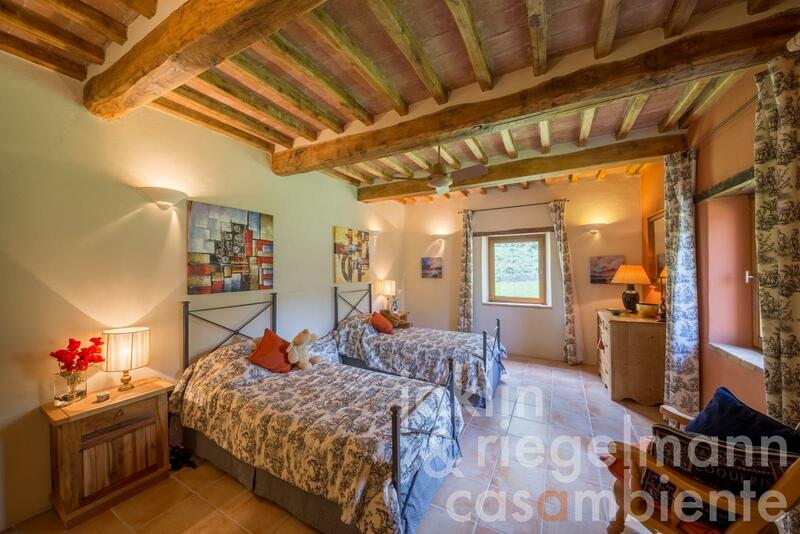 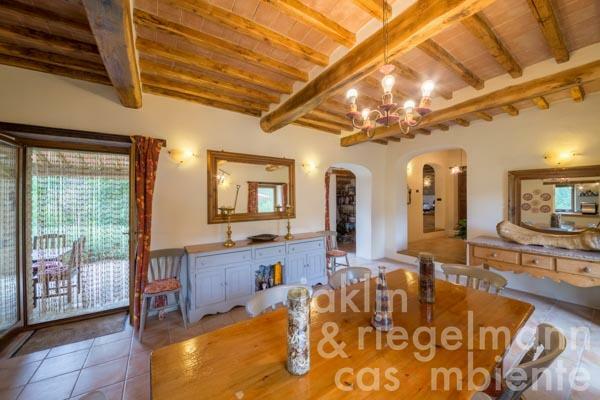 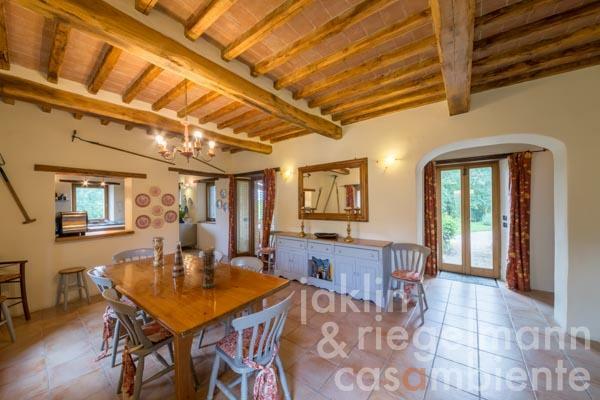 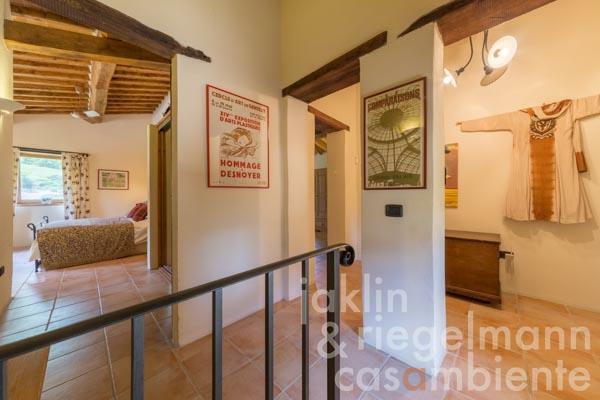 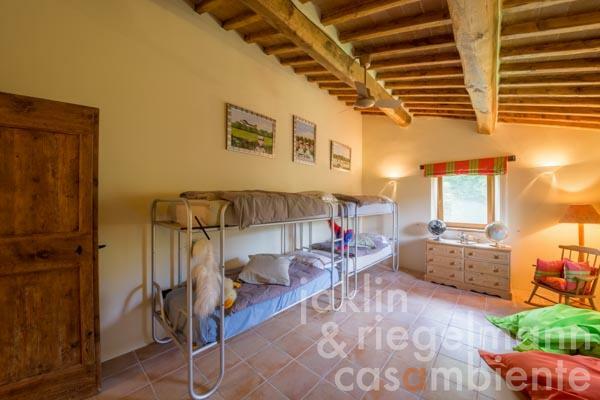 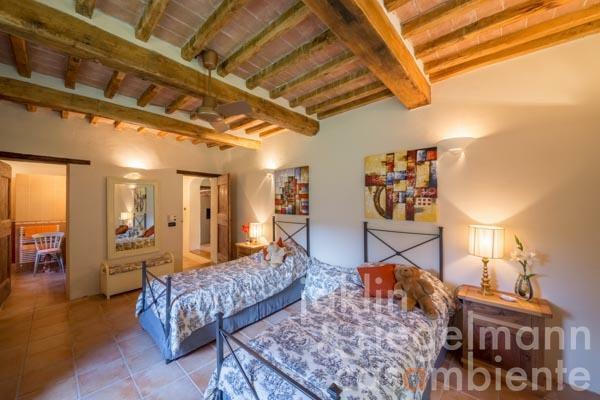 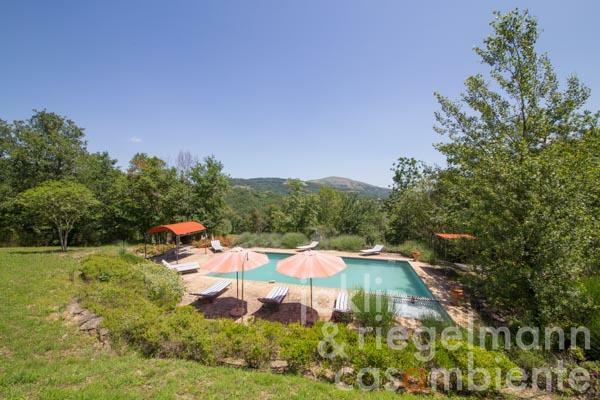 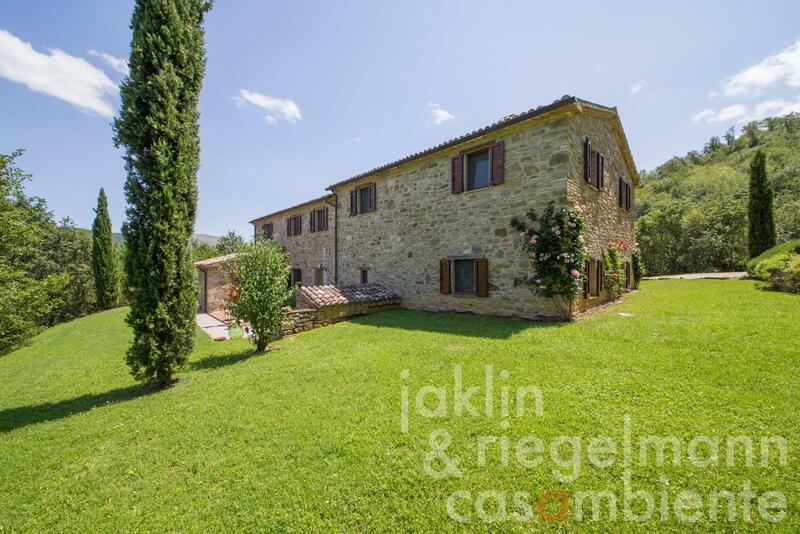 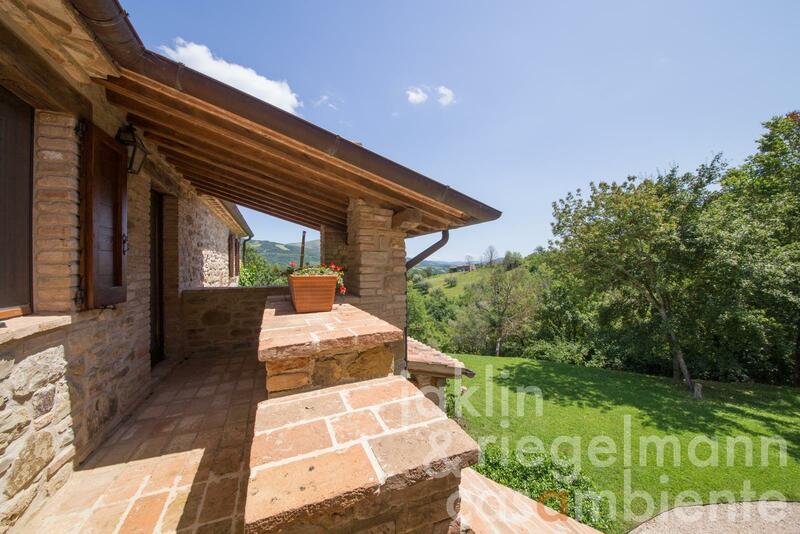 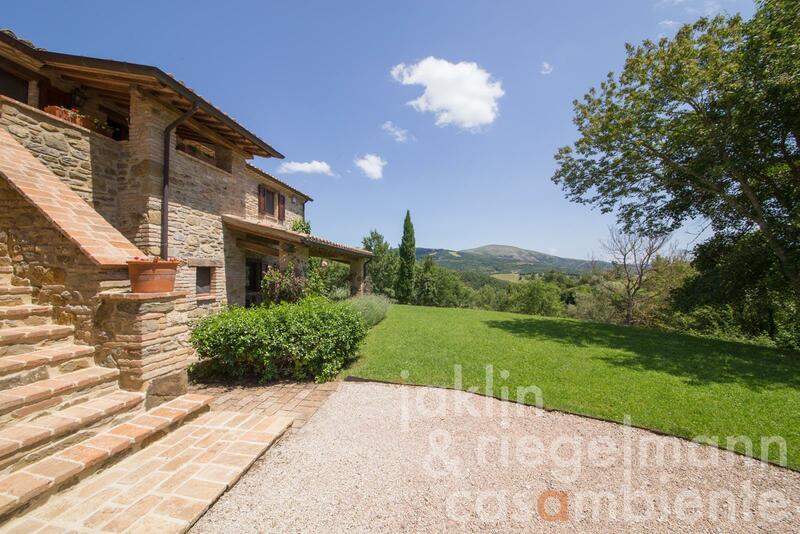 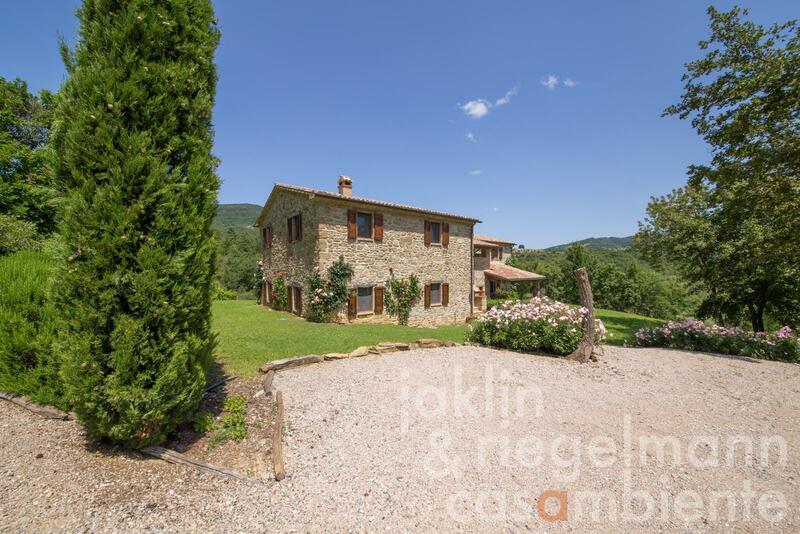 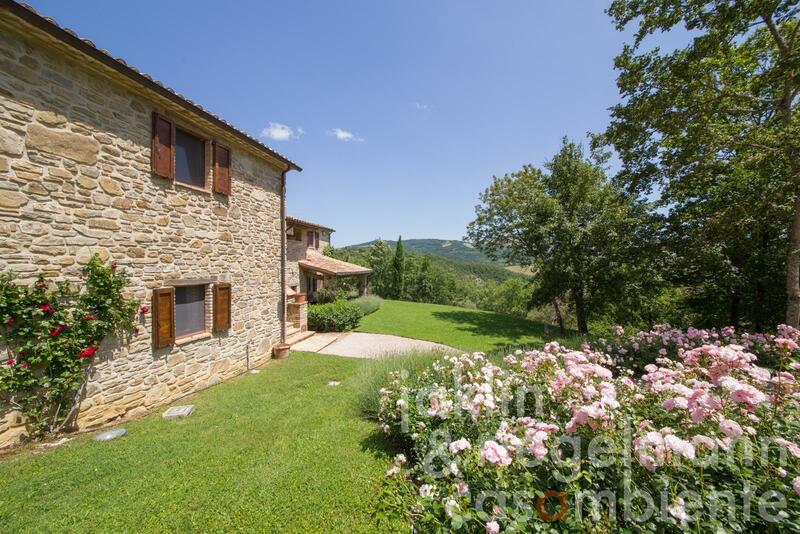 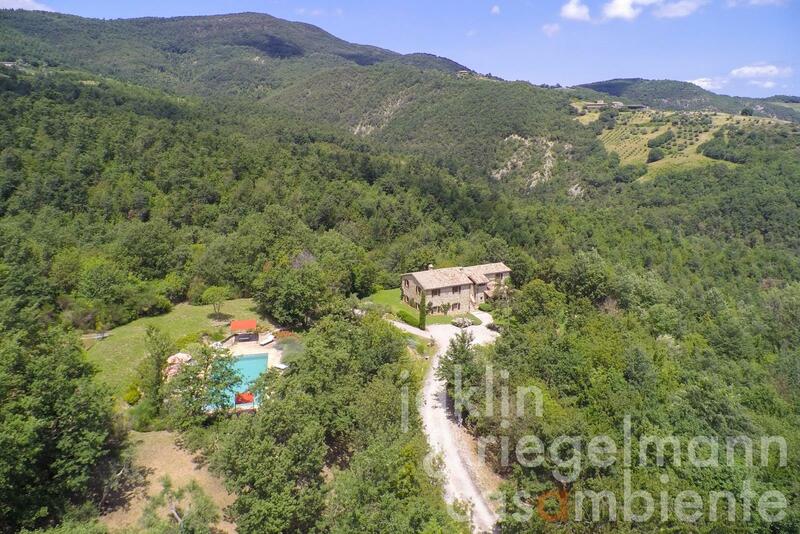 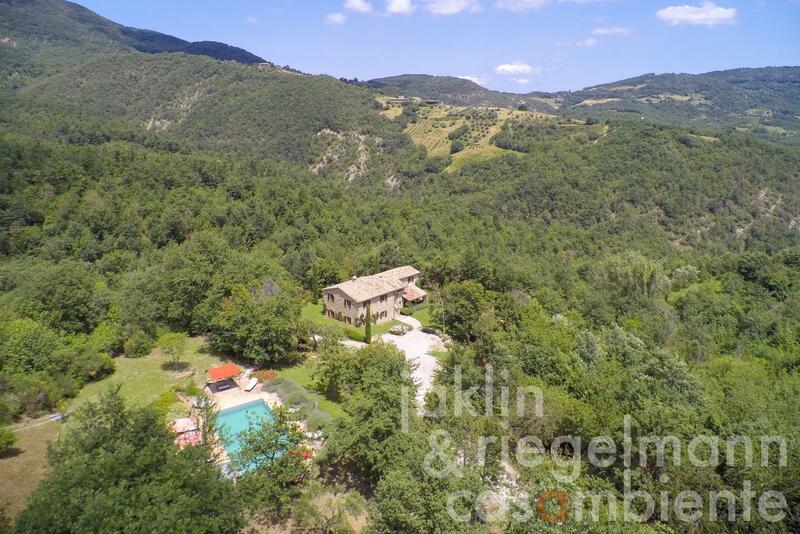 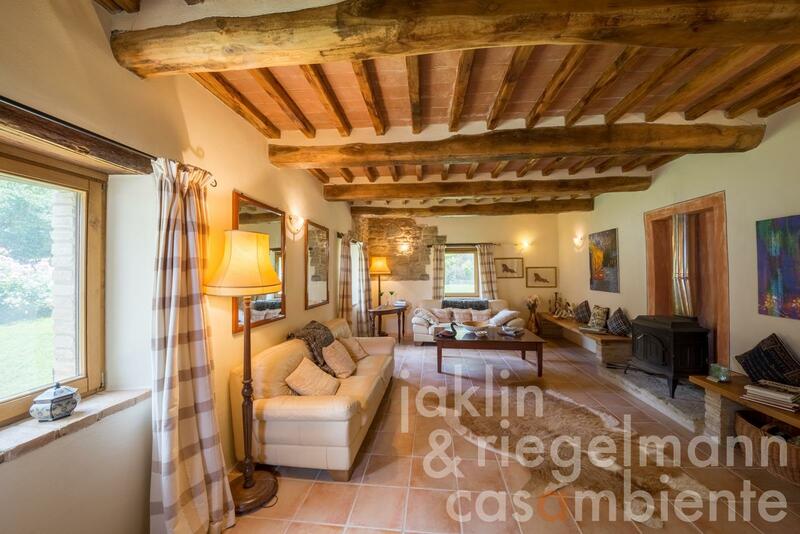 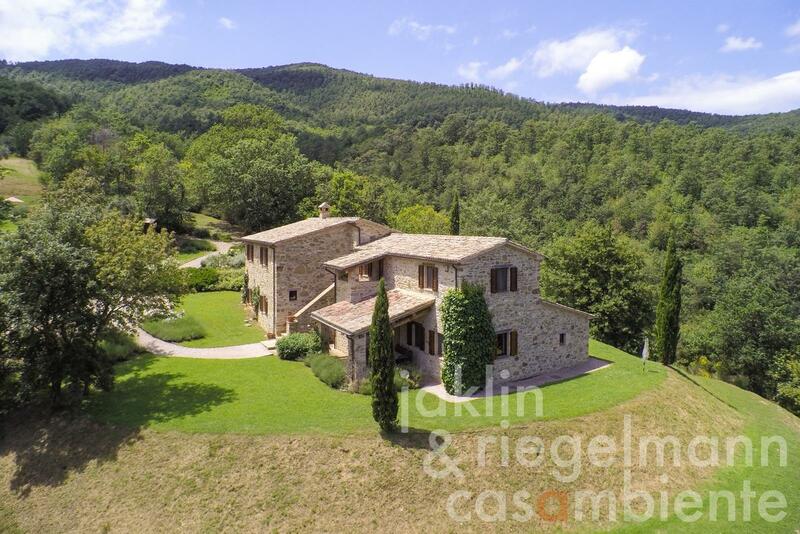 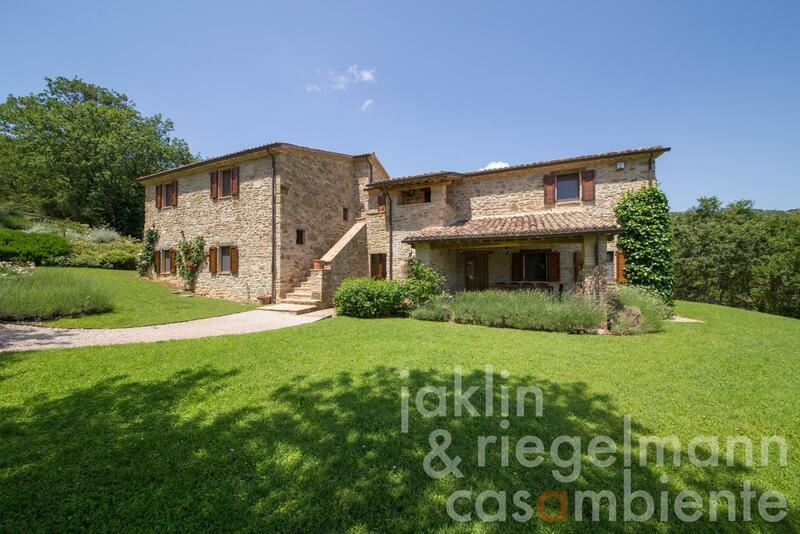 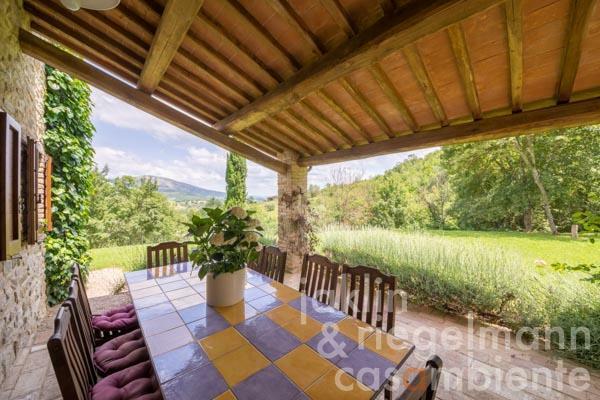 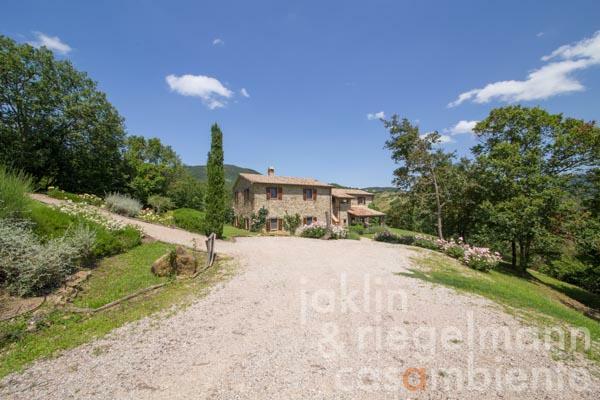 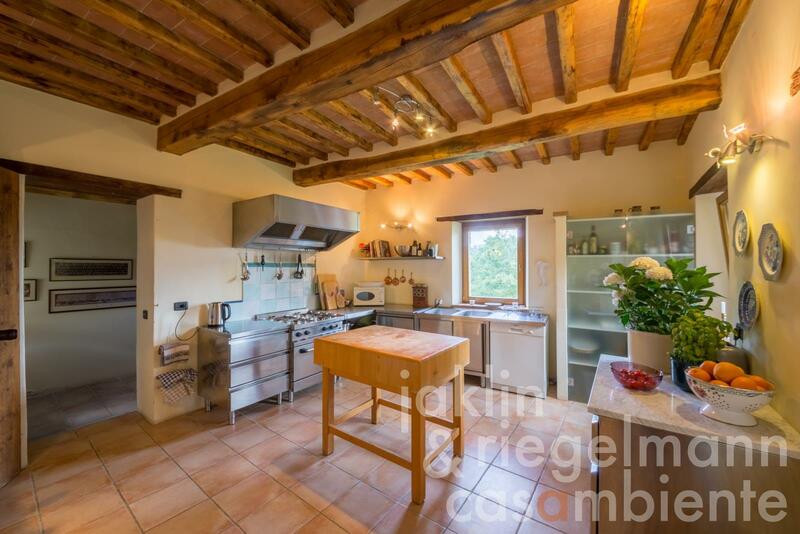 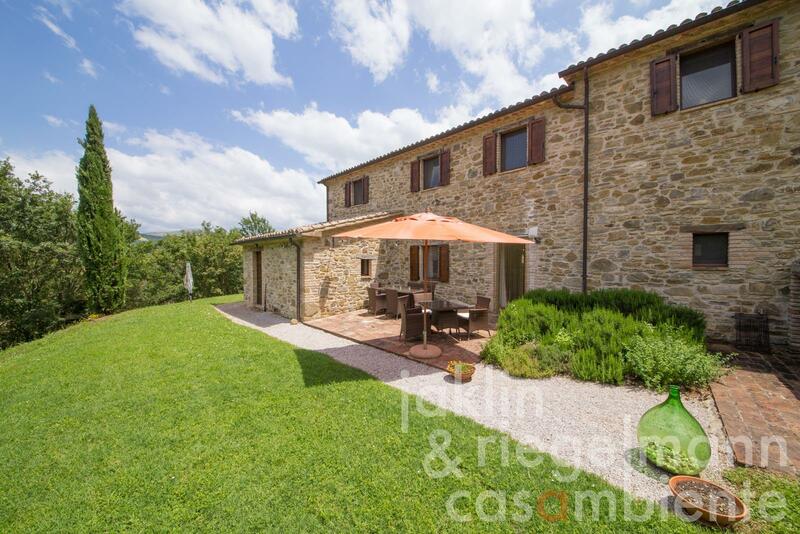 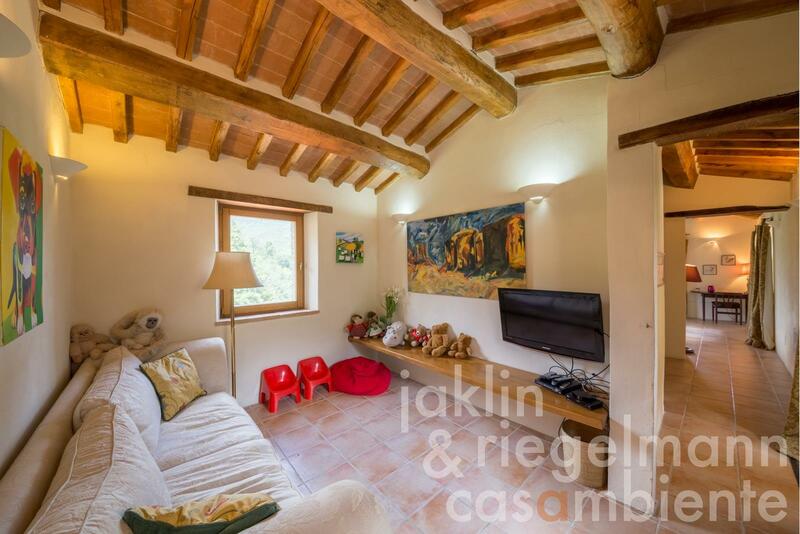 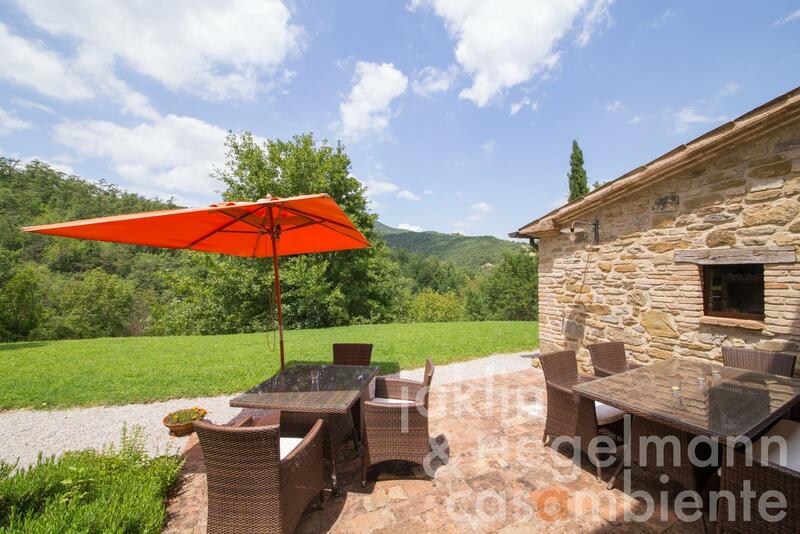 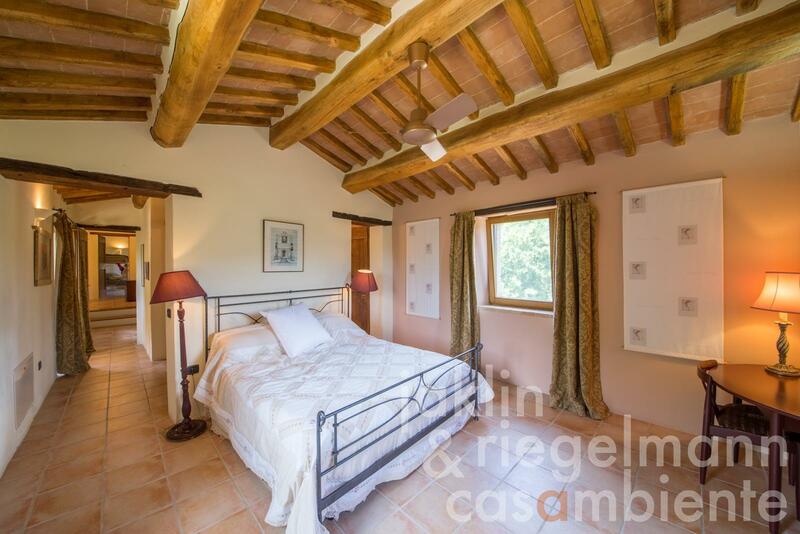 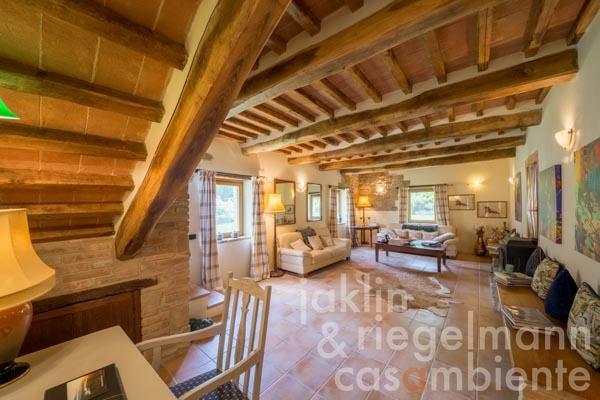 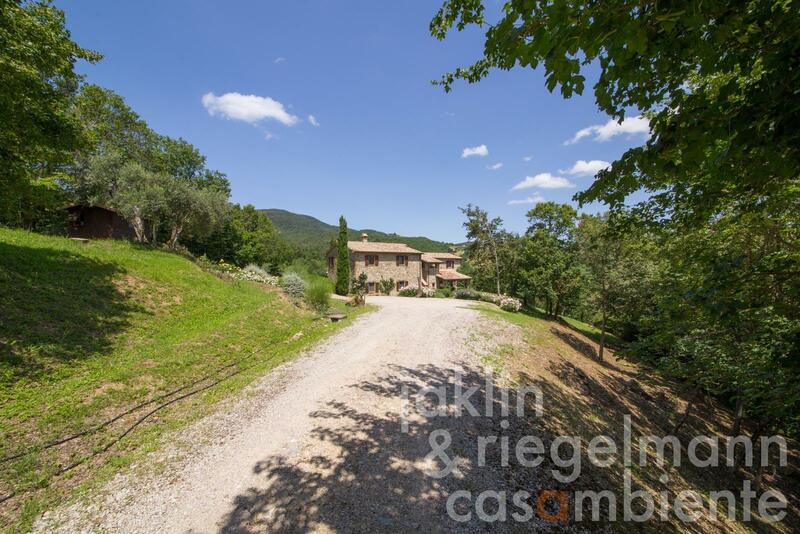 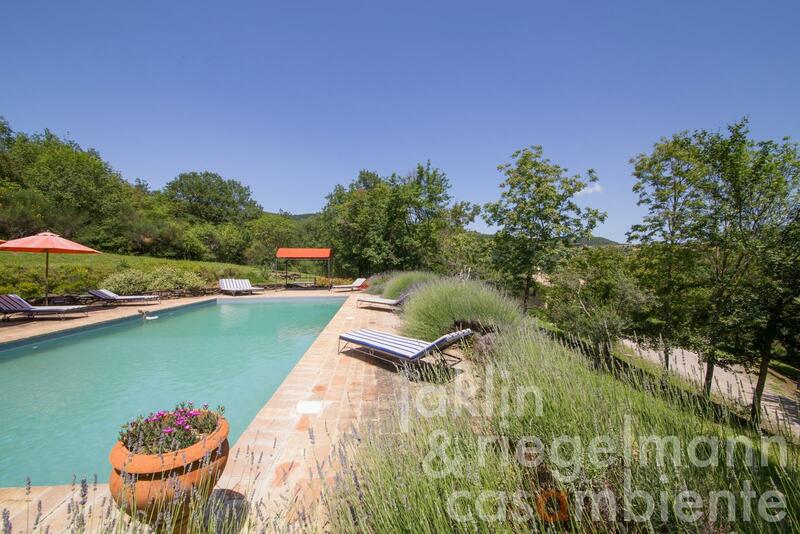 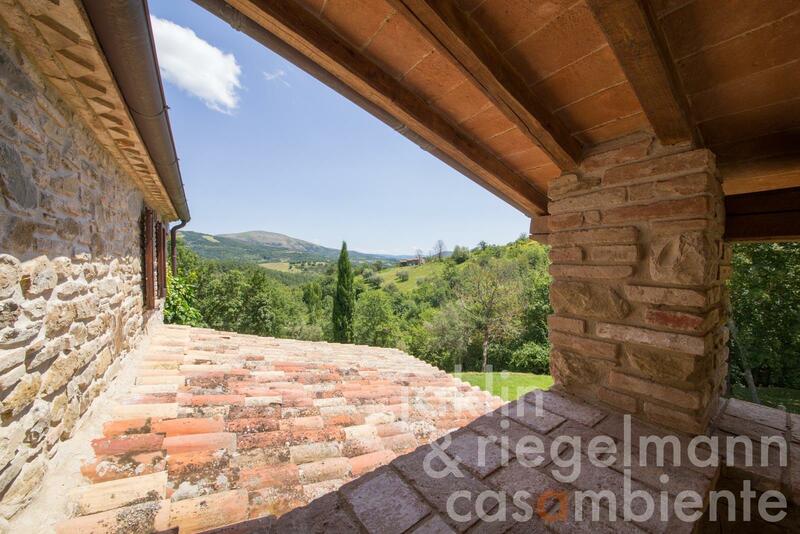 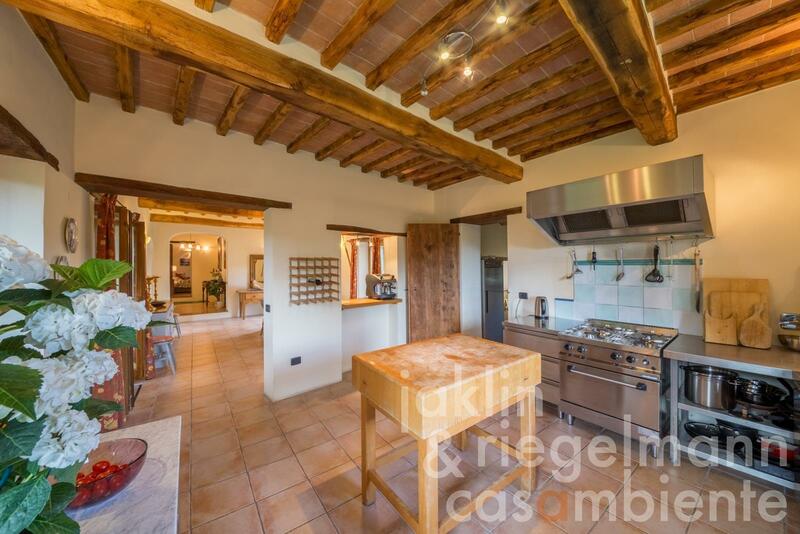 The property is ideally situated on the border between Umbria and Tuscany on about 470 metres above sea level, surrounded by wooded hills, olive groves and open meadows. There is the possibility to buy more land. To the West, Lake Trasimeno with restaurants, beaches, ferries and sailing is easily reached in about 35 minutes along with nearby trains to Rome and Florence. To the East, the historic town of Umbertide with a vibrant marketplace and supermarkets. 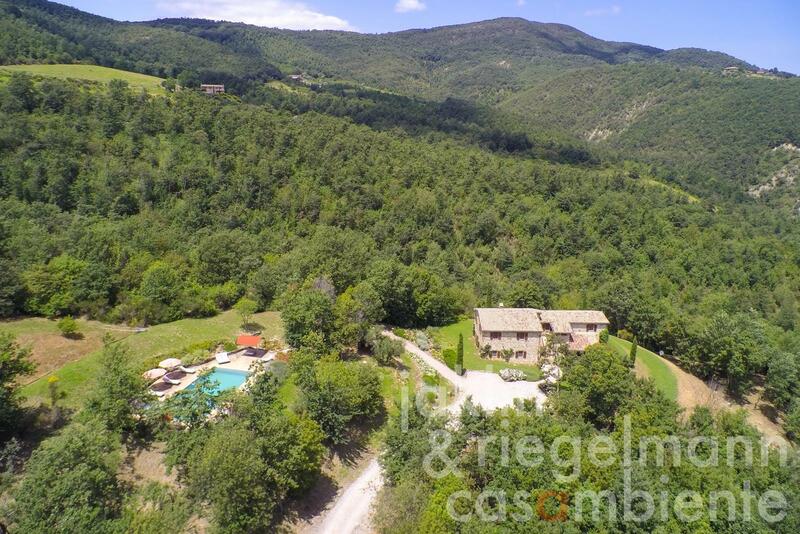 From Umbertide there is immediate access to the E45 motorway with Perugia airport being just 45 minutes from the house. 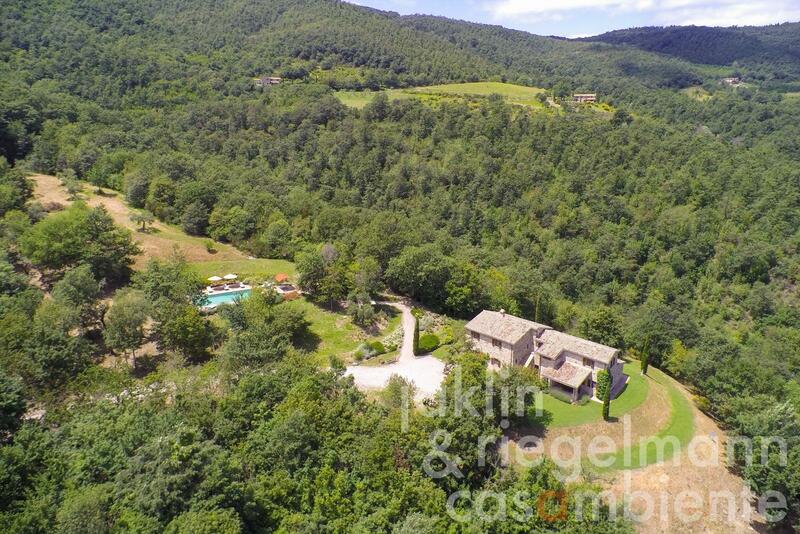 Golf at the Trent-Jones designed Antognola course is about 20 minutes, and the nearest ski slopes are only 2 hours away. Distances: Basic store 7 km; Umbertide 16 Km; Lake Trasimeno, Perugia 20-25 km; Cortona, Città di Castello 40-45 km; Assisi 55 km; Adriatic coast 118 km. Airports: Perugia 36 km; Ancona 137 km; Florence 175 km; Rome 237 km. 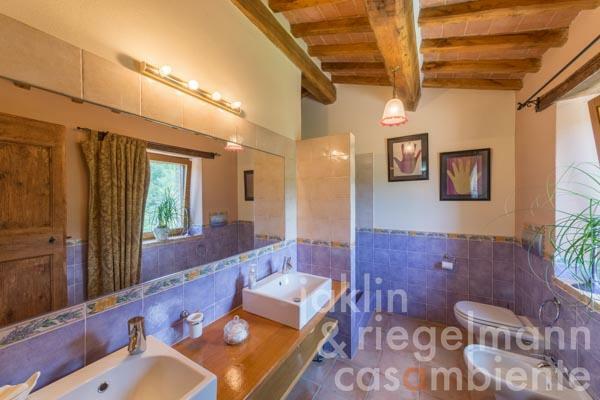 Electricity, own well water, central heating, underfloor heating, fireplace, gas tank, broadband internet access, satellite-TV, alarm system, irrigation system, swimming pool, private parking, terrace, garden.